Excellent! Following France, the Dutch people have voted a very very clear NO to the proposed European Constitution. The exit polls show that 63% of the people has voted against with 62% of the voters turning up. Most noticable was that the campaign FOR the constition used all kinds of frightening scenarios and was calling the people studid, dumb or not capable of deciding on such a complex item. But the people have given a very clear signal to the goverment and to their representatives that they aren't doing a very good job representing the people and that they don't like where Europe is going in this pace. The consequences cannot yet be overseen. Will Tony Blair indeed refrain completely from ratifying this treaty? Will other countries? Will this have consequences for (part of) the dutch government? On this site you can find what happened on this date in the past. In 2004, a federal judge in Alaska ordered Exxon to pay $4.5bn in damages for the Valdez oil spill, the largest in US history. It emerged that the Exxon Valdez had dumped 11 million gallons (41.8m litres) of crude oil and contaminated about 1,300 miles (2,080 km) of coastline. Around 250,000 seabirds, nearly 3,000 sea otters, 300 harbour seals, 250 bald eagles and up to 22 killer whales died as a result of the spill. Exxon captain, Joseph Hazelwood, admitted drinking vodka before boarding the vessel, but was subsequently acquitted of operating a ship while intoxicated. The Exxon Valdez was repaired and renamed the Sea River Mediterranean and is working in the Atlantic although it is banned from returning to Alaska. Imagine being held hostage for three years somewhere in the jungle of Colombia! Three years of hardly any contact with the outside world, of being watched all the time, of constant relocation. It is the fate of the now 43 year old Colombian former presidential candidate Ingrid Betancourt who was kidnapped in February 2002 by guerrilla organization FARC (Revolutionary Armed Forces of Colombia). Her impassioned calls for an end to political corruption and Colombia's vicious civil war had made her a popular public figure, but a dangerous instigator to many within her country's political machine. Even in captivity she hasn't stopped protesting: she nearly died in the course of one of at least three hunger strikes while in captivity. On Feb. 23, 2005, the anniversary of Betancourt's kidnapping, a book will come out titled "Searching for Ingrid", written by her husband Juan Carlos Lecompte. The book delves into a dirty truth about Colombia: more than a thousand human beings are kidnapped here every year and bartered for ransom. But even a king's ransom cannot get Betancourt and some others out. The rebels call them "exchangeables" and say they will be freed only in a swap for rebels held in Colombian prisons. Some of the exchangeables - including politicians, soldiers and police - have been captives for eight years. 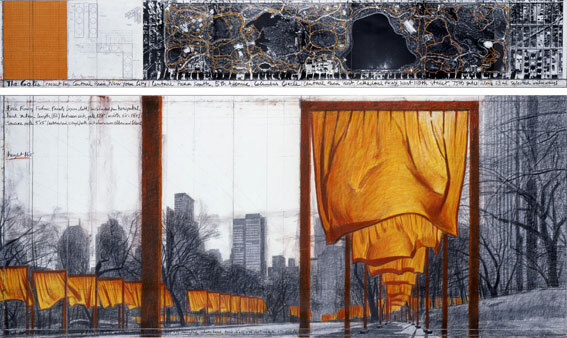 The artists Christo and Jeanne-Claude are at it again. This time they are not wrapping something, but it still will be very impressive: a 37km long trail of orange gates throughout Central Park in New York. The work of art will be completed on February 12, weather permitting, and will remain for only 16 days.